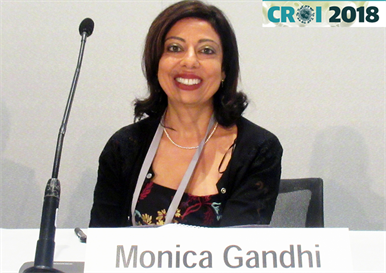 Monica Gandhi presenting at CROI 2018. Photo by Liz Highleyman. Antiretroviral drug levels in a sample of hair were the strongest predictor of response to HIV treatment, and this method also holds promise for monitoring adherence to pre-exposure prophylaxis (PrEP), according to research presented at the 25th Conference on Retroviruses and Opportunistic Infections (CROI 2018) this week in Boston. It is well know that medication adherence is key to achieving the benefits of antiretroviral therapy (ART) or PrEP. But taking medications as directed can be challenging, and PrEP trials have shown that patient-reported adherence does not always correspond to measured drug levels. Dr Monica Gandhi of the University of California at San Francisco and colleagues looked at the association between drug levels in hair and virological treatment outcomes in the ACTG A5257 trial. This study compared ART regimens containing atazanavir/ritonavir (Reyataz), darunavir/ritonavir (Prezista) or raltegravir (Isentress), all with tenofovir DF/emtricitabine (the drugs in Truvada), in people receiving HIV treatment for the first time. Antiretroviral drug levels in hair samples are a reflection of adherence over time, Gandhi explained. Drug levels can be measured in blood and in some cases in urine, but this only gives information about levels shortly before testing. Measuring drug levels within cells – where antiretrovirals must reach to be effective – is more complex. Hair testing avoids the "white coat" effect, in which an individual could take their medication inconsistently but do so before a medical appointment, Gandhi said. In addition, hair is easy and cheap to collect and samples can be stored and shipped at room temperature without biohazard precautions. However, hair testing currently must be performed in a lab and cannot be done in "real time" while a patient waits. This analysis used liquid chromatography to measure atazanavir, darunavir or raltegravir levels in a single hair sample, which reflects average adherence over time. She noted that segmental analysis, as used in forensics, can assess drug exposure at different points in time by comparing levels in hair segments near the scalp and those further away, but that was not done in this study. Viral load and hair data were available for 599 study participants, obtained at 2192 visits over a median follow-up period of 217 weeks. About two-thirds were men, a third were black, 17% were Latino and the median age was 38 years. Hair samples were collected at weeks 4, 8, 16 and then quarterly during the study. Participants were asked to provide a sample of hair cut from the scalp; the hair root is not needed for testing, so plucking an entire strand is not necessary. Over half of participants (55%) agreed to give a hair sample. Gandhi noted that gay men were more likely to decline because they didn't want to disrupt their hairstyle. Across all three drug regimens, the rate of virological failure at two years – meaning a detectable viral load – was 3% for people with hair drug levels in the highest third, or tertile, and 6% for those in the middle tertile, but rose to 26% for those in the lowest tertile. Even a short period of non-adherence, reflected in a single low hair drug level, could affect adherence, Gandhi said. In fact, having a low hair drug level was the strongest independent predictor of treatment failure. People with the lowest levels were 6.8 times more likely to have detectable HIV than those with the highest levels. For every twofold decrease in hair drug levels, the risk of virological failure more than doubled. This pattern was similar across the three drugs and held after adjusting for self-reported adherence and other factors. The correlation between self-reported adherence and measurable drug levels in hair samples was weak, Gandhi said, underscoring the limitations of self-reporting. The analysis included people with processed, coloured, permed, straightened and bleached hair. Hair procedures generally didn't interfere much with drug level measurement, but bleaching had the greatest effect, Gandhi noted. The relationship between hair drug levels and viral suppression did not differ by race or ethnicity. This testing method can be used even on very short scalp hair, but if a person is bald, eyebrow or pubic hair that doesn't grow over time is not recommended, Gandhi said at a CROI press briefing. The researchers concluded that further study is warranted to see whether early monitoring of hair drug levels, followed by targeted adherence interventions for those with low levels, could help reduce virological failure. Segmental hair testing that looks at drug level changes over time holds promise for analysing HIV seroconversion among people taking PrEP, as done in another study presented at the conference. Gandhi M E et al. Hair antiretroviral levels strongly predict virologic outcomes in ACTG’s A5257 trial. 25th Conference on Retroviruses and Opportunistic Infections (CROI 2018), Boston, abstract 24, 2018. Watch the webcast on the conference website.